Lazy A Stables Ltd. - Feedback - Email by Kelby L, Bermuda, UK. This is Kelby, Sable's owner in Bermuda. I can't thank you enough for her. She is more than I ever expected. After riding her at your barn I knew she was the one for me. I had the best show season ever on her. Through the year, Sable and I bonded more and more so I decided it was time to start challenging ourselves! 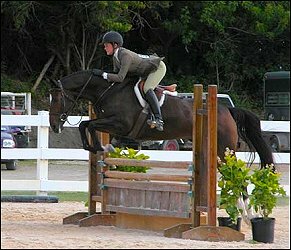 We competed in a class, “ Junior Jumper Championship.” I was the second youngest in the class, and WE WON!!!! In an open medal class, Sable and I finished having a fantastic jumping round, fantastic flatting and then they announced they had a ride off, between Catrina [trainer] and I !!!! Since Sable was only 5 I didn’t want to push her too much so we only did 2’6 -3’0 jumpers. At the end of the season we won the championship trophy. She will do anything I ask her to. We are doing 3’0 -3’6 jumpers. On Saturday we had a practice show and she was a superstar (as always!). Once again I would like to thank you so much. She is so precious and she means the world to me. I love her so much. I have just come back from the Hinson Hall show. Sable and I won both the Hunter over fences and we were Champion for that division! We won our 12-14 equitation over fences and flat. We were also Champion for that division. We won 4 Firsts and we were awarded 5 beautiful trophies, and that was just one day of riding!! Looking forward to another great year. Thank you so much. I love her. Sable and I have been asked to represent Bermuda in the F.E.I Challenge which will be held on November 20 and 21. We are entered in the “Adult B” category which consist of a very technical course of 3’6 jumps. I will let you know how we do. I’m sorry I haven’t been in touch. Sable and I have been very busy. 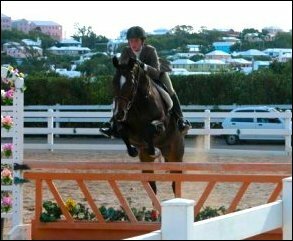 Last year in Category B for the F.E.I competition, Sable and I won for Bermuda and later found out that we won for Category 10. This led to an overall 8th place in the WORLD against 321 competitors!!!!!! Last year Sable and I also won a Rising Star series in which the jumps were 3’6. We won $5,000.I was also awarded a Bermuda Government Junior Athlete Scholarship worth $5,400. This money was put toward my summer training and competing in Canada with Mac Cone. It was the best summer of my life. This year Sable and I competed in the F.E.I Category A division and this time the jumps were 3’11. We trained everyday for 2 weeks to work up endurance for the higher and more technical courses. Sable cleared them with plenty of space below her! We were against Catrina (Adcock) Sims, Nick DeCosta, Lindsay Sousa, I was the youngest at 16 years old and Sable and WE WON!!!! Now we just have to see how we do against the rest of Category 10 and the World! I would just like to thank-you so much for the best gift I have ever gotten. She is my baby, my guardian angel and my best friend. We are so close we would do anything for each other. Again thank- you and I will update you when we get the results for F.E.I A! !